Waterfall Trail is one of the most fascinating Branson outdoors that runs along the tributaries of Roark Creek including some beautiful rock formations and a dense of tree canopy. This trail is recently developed within the city of Branson. This 2/3 mile trail features an unpaved footpath, rugged terrain in some locations and crosses a creek in two locations. Located just about 300 feet north of the intersection of Roark Valley Road and Shepherd of the Hills Expressway, Waterfall Trail is subject to closing during and after heavy rain as it runs along a natural creek. There’s a limited parking near the trailhead. Beautifully located in the heart of the city, Waterfall Trail is somehow makes visitors feel like they are in a secluded place. The trailhead is accessible from the intersection of Roark Valley Road and Shepherd of the Hills Expressway. When looking for a parking area, head on to the trailhead just behind the guard station to Westgate Resort. While Waterfall Trail is relatively short at only eight-tenths of a mile, it’s moderately difficult to hike due to the 150-foot climb in elevation by the time you reach the waterfalls at the top. Hiking on this trail begins in an open meadow, then descends into a thick wooden area, and from this area you’ll continue your hike in a flowing stream. You’ll be crossing the trail three times. The crossing on the streams can be very difficult after rains when the water level of the stream has risen. You’ll see some rocky and muddy sections of the trail so take precaution with your footing. When you reach the end of the trail, you will find an open space, with a small pool at its base. Once you reach to this point, you’ll be rewarded by a gushing waterfall in the spring months. The rugged terrain of .7 mile trail features picturesque scenery of mature forest canopy, natural pools, rock outcroppings and a large waterfall. After heavy rains, the trail can be impassable immediately. Without the rain, you’ll experience fairly level hike, but when it rains, the creek swells, so be careful during rainy days. As the trail crosses several times in the creek, and some parts puddle, it’s a good idea to wear shoes that can handle at least 1 inch of muddy water. 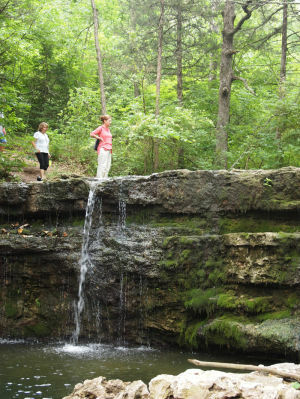 As you continue scenic hiking on the Waterfall Trail, you'll see several small waterfalls and some small bluffs. At the end of your hike you'll find the reason for this trail's name: a several-foot-high waterfall. The waterfall features a breathtaking view from several angles, and you can continue on the trail to the top of the falls and even continue hiking upstream. Or you may like to experience a unique fun sitting on a rock nearby and have a picnic lunch with friends. As one of the most fascinating Branson outdoors, the Waterfall Trail in the heart of town is a great way to enjoy the beauty of nature.